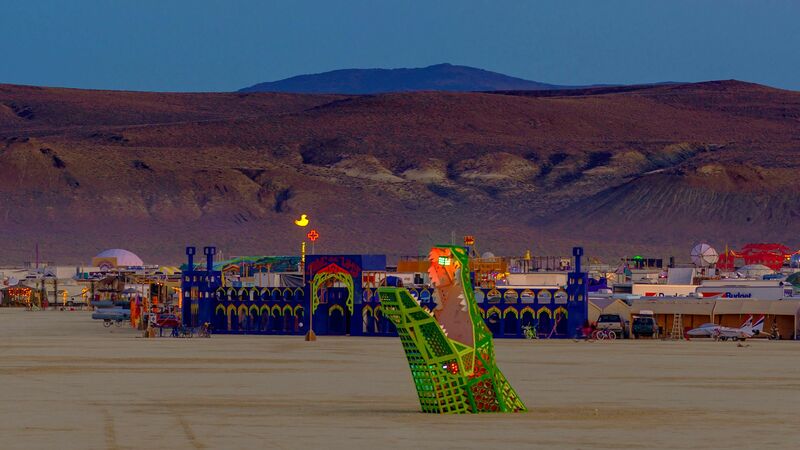 Camp Above The Limit is a creative, ever-evolving camp that lives by the Ten Principles of Burning Man. We believe that our members should all participate and work together for the enjoyment and success of participants, camp, and the event itself. The 2014 Caravansary theme led to research across all of the ancient Silk Routes. We were captivated by the architecture, light, and the tales of travelers. Then we found this short video that really inspired us! Twilight began design in January, and our prototype was successfully completed at The Generator in early April... Phoenix led the construction efforts, and he and build crew lead Ethan spent countless days, nights, and weekends working with dozens of camp volunteers to create our structures. JM spent weeks creating and painting the giant and spectacular laser-cut lattices. Despite long odds, it all came together. The Crystal Medina arose as our tribute to the theme and to our camp's past. You couldn't miss us on Esplanade and the 9:00 Keyhole. Outside was a study of shape, light, and color. Inside was an inviting oasis of refreshment, relaxation, music, exotic scents, art, and conversation, with a backdrop of the silks, shimmering lights, shadows, and textures that provided respite from the journey through our very foreign lands. Along with our subcamps Echo and Eurotache, the ATLanteans thank all of you who visited us and enjoyed our hospitality at the Turkish Delight Cafe, the Oasis Tavern, and the Afterburner Lounge. Thanks to all of our 2014 camp members who worked so hard on construction, entertainment, hospitality, the Camp Dinner, camp support, and tear-down/clean-up. Special thanks to Kevin and Twilight for their harrowing and heroic efforts to bring everything back off the playa.